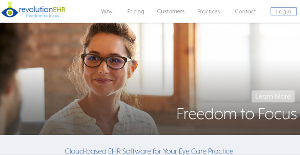 RevolutionEHR is a software service that caters to the needs of opticians and optometry businesses. It’s a cloud based practice management software that enables practitioners to carry out their business related operations with simplicity and efficiency. RevolutionEHR relieves you from a lot of paper work. The primary aim of this software was to ensure that optometrists enjoy and focus more on their work than tackling IT related problems just to make sure that their business runs smoothly. With a set of some powerful features, RevolutionEHR can easily replace any of your current management systems and bring more efficiency to your business. With RevolutionEHR in place, you no longer need any papers to stay organized. Electronic Health Record systems have the most advanced features these days and RevolutionEHR is no exception. In addition to HER, the software also provides features for appointment scheduling. This enables you to digitally organize all your patients and bypasses any chances of clashes. In addition to scheduling, you can manage all the important documents as well as generate letters for your patients and peers. It helps you to keep all your patients and clients in loop and lets you promote your clinic through digital and paper media. To give your patients the best of services, there is also a personal health management module in this software. Your patients can access their record online and also check financial matters such as account balance and payment history. It works with desktops and mobile devices so the information is accessible from literally anywhere. To take care of sales of optical products, RevolutionEHR also offers inventory and order management services. It takes care of all relevant aspects related to sales such as bar code scanning, printing of labels, product catalogs and much more. There are some interesting integrations also available to make your sales work easier. Since it is a cloud based software, you need not to install any servers at your workplace. It also ensures that your important data is safe and secure. Also, it means that you can access and edit your business information from anywhere. There are intuitive reporting tools and analytics available in this software as well. You can also set permissions on data access if you are having a large team of doctors at your workplace. If you are considering RevolutionEHR it could also be a good idea to check out other subcategories of Best Business Process Management Software gathered in our database of B2B software reviews. Every company is different, and may need a specific Business Process Management Software solution that will be adjusted to their business size, type of customers and employees and even particular niche they cater to. It's not wise to count on locating an ideal app that will work for each business no matter what their background is. It may be a good idea to read a few RevolutionEHR reviews first and even then you should keep in mind what the software is intended to do for your business and your staff. Do you need a simple and straightforward service with only basic features? Will you really make use of the complex functionalities required by experts and big enterprises? Are there any particular tools that are especially useful for the industry you work in? If you ask yourself these questions it will be much easier to locate a solid service that will fit your budget. How Much Does RevolutionEHR Cost? We realize that when you make a decision to buy Business Process Management Software it’s important not only to see how experts evaluate it in their reviews, but also to find out if the real people and companies that buy it are actually satisfied with the product. That’s why we’ve created our behavior-based Customer Satisfaction Algorithm™ that gathers customer reviews, comments and RevolutionEHR reviews across a wide range of social media sites. The data is then presented in an easy to digest form showing how many people had positive and negative experience with RevolutionEHR. With that information at hand you should be equipped to make an informed buying decision that you won’t regret. What are RevolutionEHR pricing details? What integrations are available for RevolutionEHR? If you need more information about RevolutionEHR or you simply have a question let us know what you need and we’ll forward your request directly to the vendor.